David is a trial lawyer who is experienced in complex business and real estate litigation matters, including breach of contract, breach of fiduciary duty, shareholder and partnership disputes, lease disputes, and employment law claims. He regularly practices in both State Court and Federal Courts across the country. He’s tried cases before juries in Superior Court and retired judges in arbitrations. David understands the complexity of litigation and that each client requires a unique strategy and approach to his or her case. David prides himself on working closely with his clients to tailor a strategy that best fits the client’s goals. 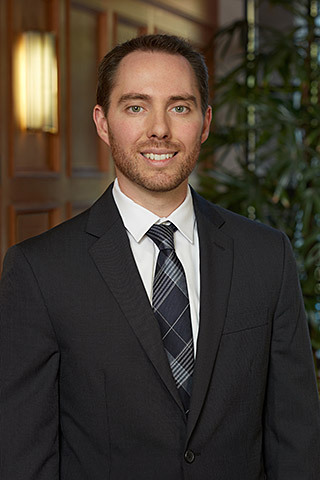 David, who is a native San Diegan, began his legal career at a large, prestigious San Diego law firm where he practiced civil litigation for six years. David has been recognized by several publications as a top attorney in the San Diego legal community. Represented owners of a residential care facility for the elderly (RCFE) in arbitration against co-owner who attempted to misappropriate clients’ ownership interests in the business for himself. Represented client in two-week jury trial involving claims of breach of fiduciary duty, interference with economic relations, and Federal and state computer fraud claims in dispute between owners of a defense contracting company. Represented technology incubator company in two-week arbitration involving claims for misappropriation of trade secrets and breach of contract. Represented partner in hedge fund in breach of fiduciary lawsuit resulting in settlement. Represented sanitary supply company in prosecution of copyright infringement action against competitor resulting in settlement. Represented national contractor in defense of Miller Act claim in the Southern District of California resulting in settlement. Represented national bank in defense of claim for wrongful foreclosure resulting in settlement. Represented lending institution in defense of mechanic’s lien claim resulting in dismissal of action at the pleading stage. Routinely represents craft breweries in a wide range of business and real estate disputes.